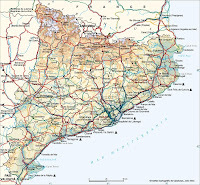 Driving overseas is a great way to explore, Salou and the Costa dorada you can hire a car any time. The rules of the road can be very different, so it is important that you obey them. Hiring a car enables you to visit more towns, villages and attractions within the Costa Dorada area at your own leisure. The Costa Dorada is famous for its beaches, resorts and theme parks. With its many exciting sites to explore and easy access too many more, this area has become one of the most popular vacation destinations in Spain. 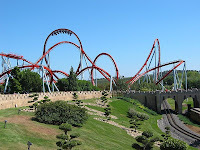 Easily the largest tourist draw to Salou is Port Aventura, a theme park. This theme park is filled with restaurants, shows, games, and of course rides. Featured, and dominating the skyline for miles around, is one of the largest rollercoaster’s in Europe, the terrifying and exciting Dragon Khan. Salou contains several relics that stand as testament to its rich history. During the 13th century, King Jaume I conquered this city from the Moors and is still revered today. This beach town is awash in activities for holiday makers. Beyond the beautiful beach and its sunbathing and swimming options, Salou offers parasailing, golf, tennis, cycling, horseback riding in addition to its great restaurants, family Bars and clubs. Another option is the Aquopolis Water Park or Caribe Water Park. These parks have waterslides for all the family. Salou is also well placed as a base for exploring other interesting places. Not far from Salou and easily reached by car is the town of Figueres which features the Salvador Dali Museum. It is also near the famous city of Barcelona just 1 hour by car with its magnificent Gaudi architecture and Montserrat spectacular mountain monastery. A bit closer to Salou you will find Tarragona which has many Roman ruins including the amphitheater. You can also experience Cambrils a small fishing village just a 15 min drive away from Salou, and watch the fishermen bring home their live catch on an evening. By hiring a car you experience the Delta Ebro, with its fantastic scenery and fishing, just 25 mins down the coast. Hiring a car gives you the freedom and choice of planning endless activities and sights for your trip to the Costa Dorada. Villa Marina is in the perfect location for you to go and explore the Costa Dorada by car. 3 well known car hire companies here in the Costa Dorada are Hertz, Europcar and Avis, and the average price for a small car for 1 week is from 230 – 300 euros.